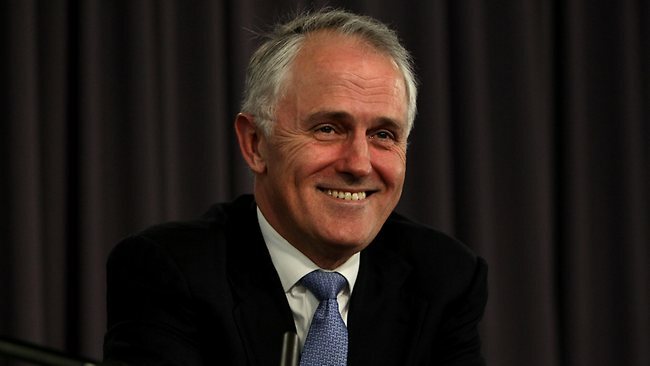 Reading the papers over the last few days, it’s hard to find anyone who doesn’t think that Malcolm Turnbull’s sudden rise to PM is good news for the economy. Malcom is a markets guy. He’s the former head of Goldman Sachs in Australia, a corporate lawyer for the late Kerry Packer, and a technology entrepreneur who helped set up OzEmail. He sold his stake in the start up, reportedly for $57 million in 1999. He gets results. But making money in any given market, and managing the market are the totally different things. We’ll see how he goes. It did cause a little bit of a rally in the Aussie dollar, which until then had seemed like it was on the long march back towards 50c. My bet is we’ll see a bit of a pause here around the 70c level, but once things settle down a little, the Aussie dollar will continue to head south. And that’s because the fundamental factors driving it’s decline are too large and too enduring. And what we’re really talking about is the transition away from mining, which earns lots of export dollars, to domestic industry, which doesn’t. Any hic-cup in the local economy, or even another rate cut, which seems likely to my mind, will just accelerate the dollar’s decline. The AFR is reporting that Deutsche Bank chief economist Adam Boyton reckons the Aussie dollar will slide to US66¢ by the end of this year, and would have a “50s handle” by the end of 2016. 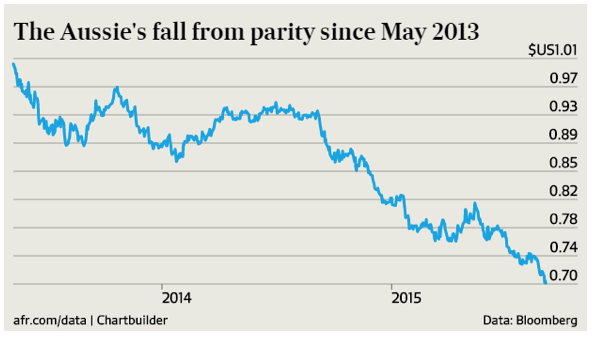 “A weaker Australian dollar is a necessary part of the adjustment to a post-mining economy,” Mr Boyton told the AFR. And what would that mean for property? Well the short answer is that it’s a big plus for property prices, but not a consistent one. Because when the Aussie dollar falls, Australian property becomes cheaper to those people buying it with foreign coin. Take Sydney for example. Sydney prices have grown 18% over the past year. But the dollar has fallen 25% this year. And so to foreign buyers (well in US dollar terms at least) Sydney prices are actually about 7% cheaper. So think about that for a sec. You’ve got a market that’s booming, where capital values are rising quickly, but the actual purchase prices are falling! High-performance properties at discount prices. Foreigners are licking their lips. And that increase in foreign demand will push prices even higher. But this isn’t a running through the fields throwing daisies about type story. Because foreign buyers, so far, tend to buy in very particular locations. They’re not shopping across the board. They’re not buying fibro cottages in Wagga. So far we’ve seen foreign activity concentrate in Sydney and Melbourne, and in particular suburbs and segments at that. Think inner-city high-rises for example. So we could be looking at a two-speed property market, with foreigners pouring jet-fuel on particular segments, and the rest of the country chugging along with the regular cycle. And some segments could become over-blown. I’m already looking at some of the high-rise development’s being flogged off to foreigners and wondering how long it can last. So there’s lots of opportunities here, but you’ll need to have your wits about you.